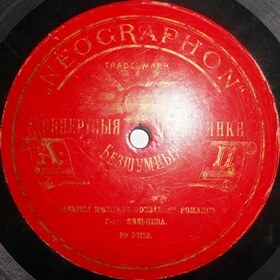 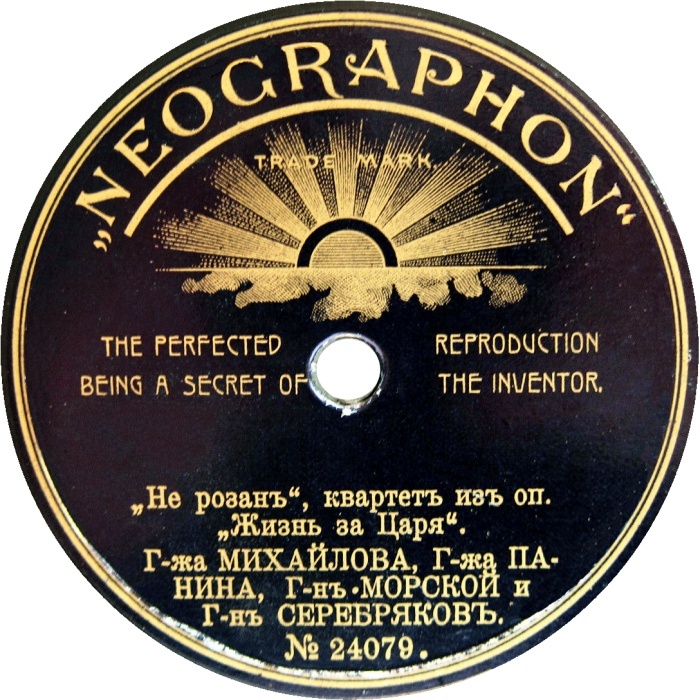 The «Neographone» label began its activity in 1902 in Moscow and was the very first one in the field of manufacturing piratical “copied” phonograph records in Russia. 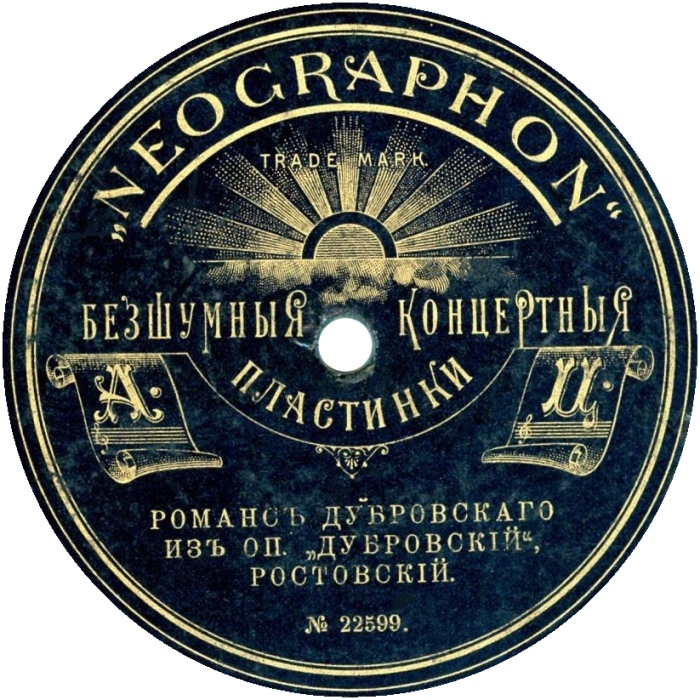 Since in those early years did not exist the legislative foundation protecting authors rights (copyright laws), their business had thrived, and the company even opened the branch in St. Petersburg. 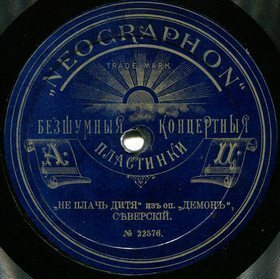 Mostly, they copied the records of «Gramophone Company» by making galvanic copies and use them for printing huge numbers of copied records. 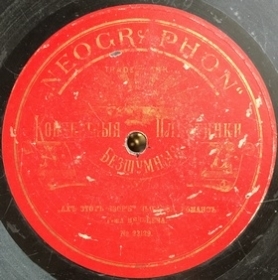 The «Gramophone Company» tried to fight with pirates as much as they could, but without copyright laws it was a difficult task. 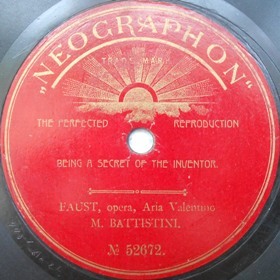 Finally, some help came from the artists themselves. 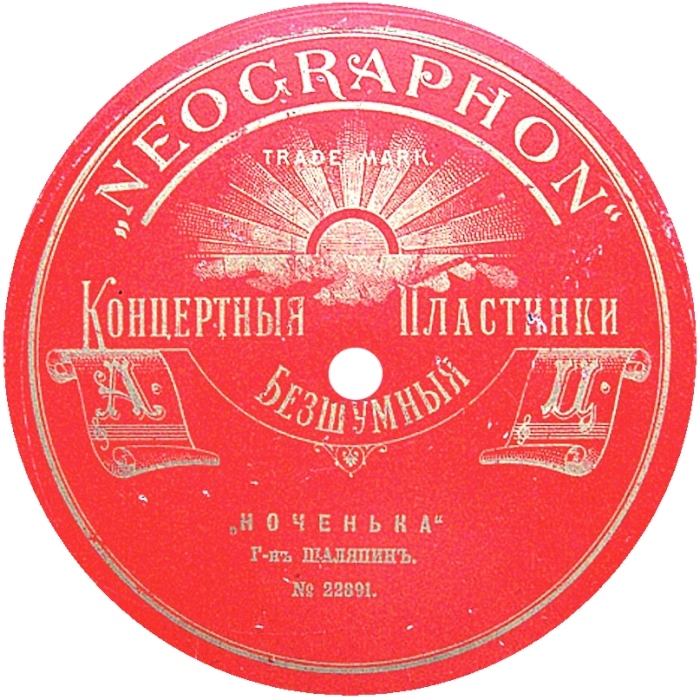 In September of 1903 they petitioned the Central Agency of Printed Matter: “Regarding ads published by «Neographone» company about phonograph records allegedly sung by us, we, hereby, stating that had never sung for «Neographone» company, and that this company deceives public by selling apocryphal phonograph records”. 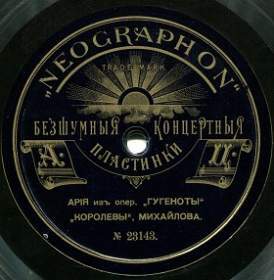 The petition was signed by: "Soloist of His Imperial Majesty N.N.Figner, Professor A.V.Verzhbilovich, Messrs artists of Imperial Russian Opera: A.M.Davydov, G.A.Morskoy, L.M.Sibiryakov, V.S.Sharonov, Miss M.A.Mikhailova" and many others. 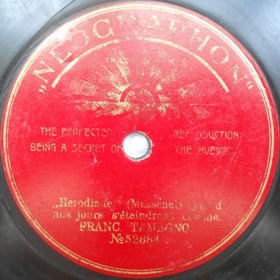 It helped and the Central Agency of Printed Matter resolution ordered “censor committees and individual censors especially strictly review catalogs of such companies and do not allow featuring of artists’ names in those catalogs as well as on labels of phonograph records without due approval from the named persons for each case”. 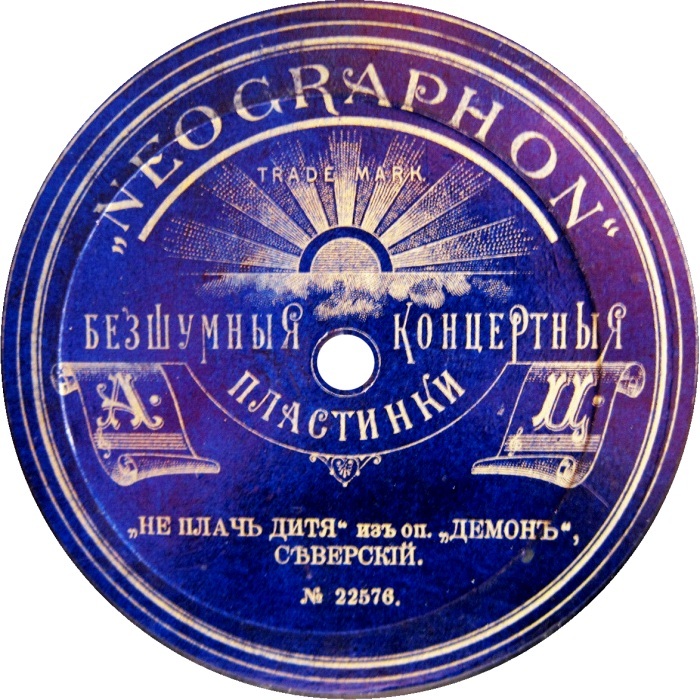 However, until passing the «Copyright Law» in March of 1911 the phonograph piracy in Russia continued to thrive that confirmed by the vast number of Labels in this category. 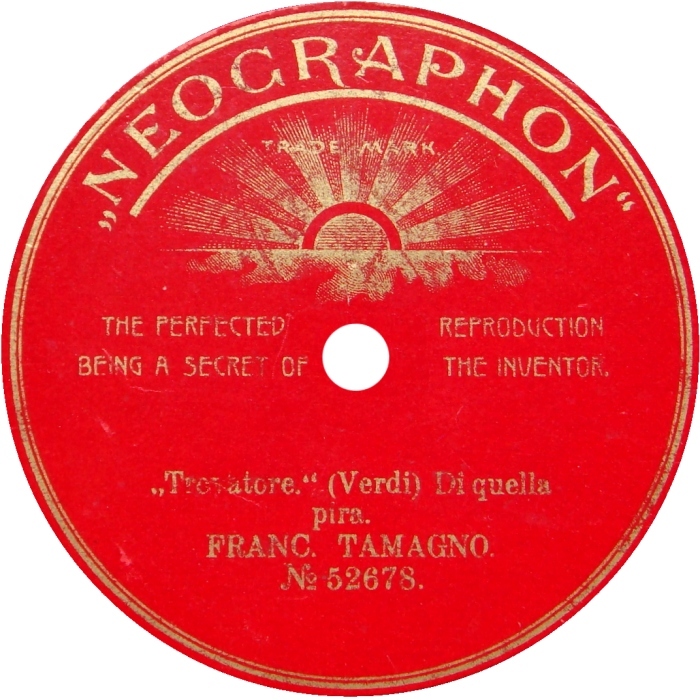 Neographon (red, latin), Gramophone Co.